The Cedar Valley Log Loveseat is made from Northern White Cedar logs and will match any decor, whether at your rustic lodge, log cabin, country cottage or lakeside retreat. The logs are German peeled to give a rustic appearance, relatively smooth but the area around the know is a little rough. 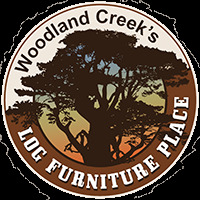 With the Cedar Valley Log Loveseat, you may choose from our several finishes, Natural Clear, Honey Amber, American Chestnut or Barnwood Lager Finish.The cushions come in a variety of fabric choices so you can pick the look that best suits your needs. The cushions used in this loveseat are firm, yet soft enough for comfort. Please note, if you order an upgrade fabric which adds money, it will add an additional 1 to 2 weeks before shipping.